After a tap on the Dashboard button in the main menu this panel is shown. See Section 4.2, “Menu”. The Dashboard section is automatically refreshed every 60 seconds. Community member: The name of the community member organization (empty when no Member Card was imported). Cardholder : a community member. Visitor : a visitor of the community. Exceeded : the number of users in the database exceeds the number of Member Card participants. Expired : the Member Card reached end-date. Visitor Expired : the visitor period expired. Visitor Edition : a permanent visitor with 5 users or less in the database. Invalid version : the Member Card is incompatible with this SavaPage version. Invalid : the Member Card is incompatible with this community. Participants : the number of community participants. Valid till : expiration date of Member Card. Days remaining : number of days till Member Card expires. Mode : the system mode. Press the button to change the mode to Maintenance or Production. Access to all Web Apps is restricted to users with Administrator role. Regular users are shown a message explaining the situation, at the Login dialog or in the authorized session. Ready to use : SavaPage can be used without impediments. Setup is needed : There are one or more options that need to be set up. Access to the User Web App is denied till setup is finished. in In the Admin Web App, editing of user details and adding internal users, user groups and shared accounts will not be available. Not available : Database access is blocked because a batch job is in progress (database backup, user synchronization, database cleanup). To prevent that user actions requiring database access will block, resulting in long waits, access to the User Web App is temporarily denied. Users are informed after a login attempt or, when already logged in, are warned when actions requiring database access are not permitted. Member Card Missing : Signals a missing Community Member Card. Uptime : the time the application has been working and available. Users : the number of users in the database. Deleted users are not part of the total: see Section 4.4.6, “Deleted Users”. Client sessions : the number of active User Web App and User Client sessions. Recent errors : the number of errors that occurred in the Application Log during the last hour. Recent warnings : the number of warnings that occurred in the Application Log during the last hour. SSL valid till : when the SSL certificate expires within a year, its expiration date is shown . When expiration is due within 30 days it is shown in orange. OpenPGP information is shown when server keys are configured: see Section 11.4, “OpenPGP Settings”. Press the information button at the right to see the KeyID and Fingerprint. JVM memory : “Max” is the maximum memory the JVM will attempt to use. “Total” is the total memory in the JVM (varies over time). “Free” is the free memory in the JVM (increases after a garbage collect). HTTP sessions : the number of non-expired User Web App Session id's and their client ip addresses. Due to DHCP, the number of ip's may be greater than the number of id's. Open Files : The number of open file descriptors. Disk Space : Disk capacity and free space. Threads : An estimate of the number of active process threads. Connections : The number of active connections to internal services and the database. Proxy Print Queue : The number of pending Proxy Print jobs in memory cache and the database. Job Ticket Queue : The number of pending Job Tickets. This section lists the status of services. The Proxy Print indicator is read-only, and shows the CUPS connection status. When connectivity is broken, the switch shows “Off”, with the reason displayed at the right. Core services like Google Cloud Print and Mail Print must be enabled to be on the list. Web Print and Internet Print services are a fixed part of the list. Plug-in services like Mollie and Blockchain.info Payment Gateways are part of the list if they are enabled in their property file. 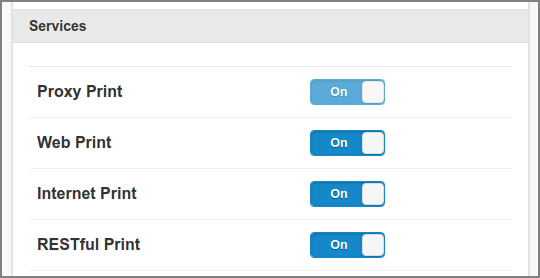 With Dashboard Editor Privileges, you can turn a service On or Off by flipping the status switch. With Reader Privileges service switching is disabled. When the SavaPage server restarts enabled core services are turned On by default. The initial state of enabled plug-in services is governed by the online setting in their property file. The on/off state of Internet Print translates to the enabled/disabled state of the reserved /internet Queue. The News section shows the currently installed versus the latest published SavaPage version. A push on the button brings you to the Downloads and Release Notes Internet page . 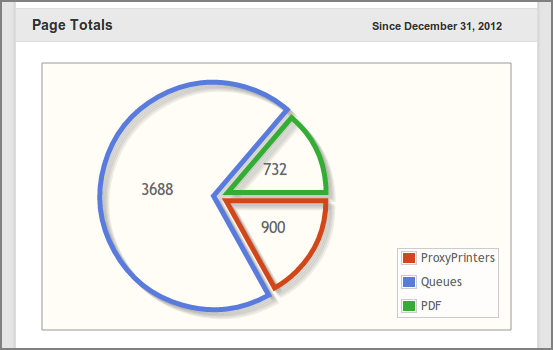 The Pagometers counting the pages printed-out with Proxy Printers, printed-in from SavaPage Queues, and exported as PDF are displayed in a Pie-Chart. Pagometers are explained at Section 4.10.14.10, “Pagometers”. 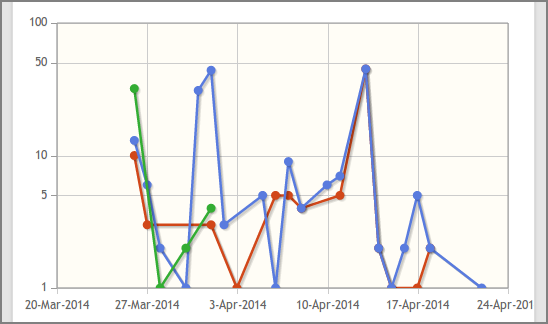 A Line-Graph shows the day pagometers for the three sources over the last 30 days. The Environmental Impact for the Proxy Printer pagometer are displayed in a separate section. The metrics and units used are discussed at Section 14.2, “Environmental Impact”. The Environmental Impact section can be hidden with configuration property in table below. Set to Y (default) or N, to show/hide the Environmental Impact section. 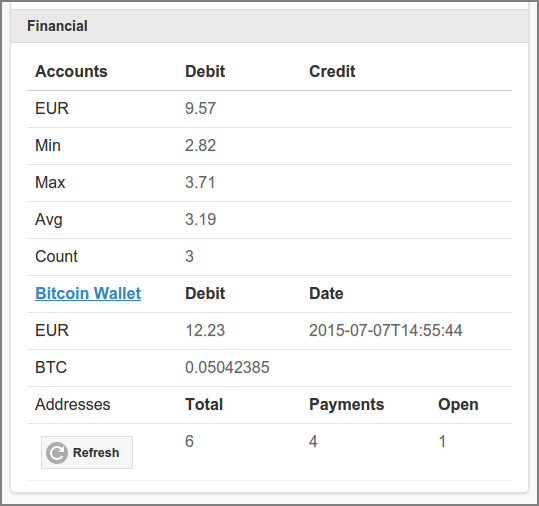 A Financial Summary of User Accounts and Bitcoin Wallet is displayed in a separate section. The User Accounts total and statistics like Min, Max and Avg are shown as Debit or Credit amount over Count number of accounts. When a Bitcoin Payment Gateway is enabled the Bitcoin Wallet balance (Debit) is shown in the system currency and BTC. The Total number of Bitcoin Addresses in the wallet are split into addresses that received Payments, and Open addresses waiting for payments. Note that other addresses, not created by our Bitcoin Payment Plug-in, may be part of the wallet (in our example there is one such address). The Bitcoin Wallet hyperlink opens the Web Wallet in a new browser tab. The Accounts summary is updated as the dashboard is (auto) refreshed. However, the Bitcoin Wallet summary is cached by SavaPage and lazy refreshed after a configurable time period (defaulting to 3600 seconds). The date/time of the last refresh is shown in the Date column. Press the Refresh button to force a refresh of the cache. Relevant system events are real-time displayed in this section. A maximum of 20 event messages remain in view, with the most recent one at the top. This file has a tab separated value (TSV) format for easy import and manipulation into spreadsheet programs. See /opt/savapage/server/lib/log4j.properties.template for more information. 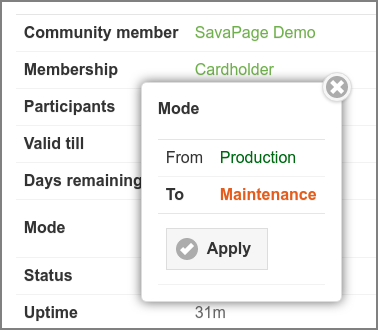 The latest published SavaPage version number is cached on the server and retrieved from the Internet every 12 hours. In analogy with the term Odometer, the term Pagometer is introduced as an instrument to count the number of processed pages. Edit the webapp.admin.bitcoin.wallet.cache-expiry-secs configuration property with the Configuration Editor to set the number of seconds after which the cached Bitcoin Wallet summary is refreshed.